The ICC World Cup 2019 is scheduled to begin from May 30, 2019, and it will end on July 14, 2019. The 12th edition of Cricket World Cup will be held in England and Wales. Former Australian cricketer Shane Warne shares his 15 members squad for Australian Cricket team in the upcoming World Cup tournament. ICC Cricket World Cup 2019 Schedule in PDF: Ticket Prices, Dates, Venue Details & Timetable Available for Download Online. 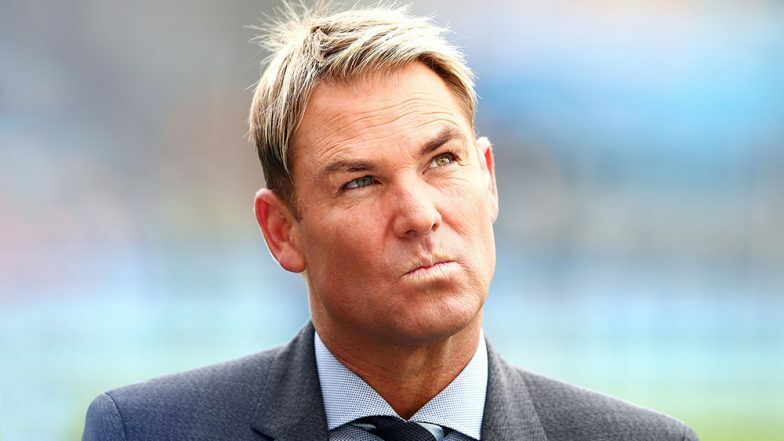 The legendary Australian spinner Shane Warne has asked his followers to put a thought on the team selected by him. Warne has surprisingly not included the name of Australian batsman Usman Khawaja, who has performed brilliantly in the recently concluded ODI series against Pakistan. The former Kangaroo cricketer also feels that right-arm fast bowler Jhye Richardson should be named in playing XI provided he clears his fitness test. Shane Warne has also added Australian all-rounder D'Arcy Short name in the list. ICC World Cup 2019 Kit: Apparel Manufacturer ASICS Uses Aussie Batsman Glen Maxwell to Unveil Australia’s World Cup Jersey. Australia will begin their World Cup campaign on June 1 against Afghanistan in Bristol. The Aussie team recently had good ODI series away from home, where they defeated the two Asian cricketing giants India and Pakistan. They defeated former by 3-2, while they gave latter a whitewash(5-0). Adding icing to the cake, David Warner and Steve Smith are performing well in the ongoing Indian Premier League tournament, where Warner has even scored a hundred.